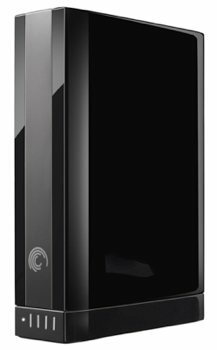 Seagate today announced a 4TB variant of its GoFlex Desk external hard drive, touting it as the highest capacity single-volume external storage device on the market. The company is not saying how many platters are inside the new drive but considering it has already announced 1TB per platter drives, we're assuming they went with four platters with an areal density of 625Gb/s per square inch. They aren't mentioning spindle speed or cache size, either. What they do mention is that the GoFlex Desk will ship with support for USB 2.0 and USB 3.0, while a Mac version shipping later this month will offer USB 2.0 and FireWire compatibility. The company’s GoFlex Desk for Mac hard drive offers similar features but comes pre-formatted in the HFS+ format. Like other members of the GoFlex Family, the GoFlex Desk allows users to change adapters to work with a range of interfaces (USB, FireWire, eSATA), and apparently a Thunderbolt update could be on the way. Seagate is also introducing a new design that will become standard across the entire GoFlex line by the end of the month. Although the company mentions that the GoFlex Desk's new design should leave "a smaller footprint," this external drive still weights 2.93 pounds and includes a power supply cord, so naturally it doesn't quite qualify as portable. The GoFlex Desk is retailing for $250 on Seagate's website and comes with a two year warranty.